A person who has visual impairments and/or hearing problems is described as having sensory impairments . When both visual and hearing difficulties are present, we call it deafblindness, dual-sensory impairment or multi-sensory impairments. 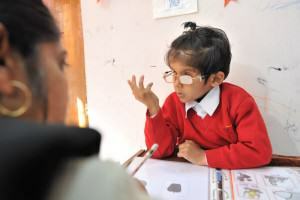 Deafblindness is a unique disability. Many deafblind people may not be totally deaf and totally blind. Some, though, have nearly complete loss of both senses. A person is called deafblind when neither their sight nor hearing can compensate for the impairment of the other sense – in other words, they cannot function either as a deaf person or a blind person. 95% of what we learn about ourselves and the world comes through sight and hearing. And because deafblind people lack these two ‘distance senses’, their mobility, communication and access to information are greatly affected. means that a person’s eyesight cannot be corrected to a “normal” level. It is a loss of vision that makes it hard or impossible to do daily tasks without specialized adaptations. Vision impairment may be caused by a loss of visual acuity, where the eye does not see objects as clearly as usual. It may also be caused by a loss of visual field, where the eye cannot see as wide an area as usual without moving the eyes or turning the head. Nearly two-thirds of children with vision impairment also have one or more other developmental disabilities, such as mental retardation, cerebral palsy, hearing loss, or epilepsy.